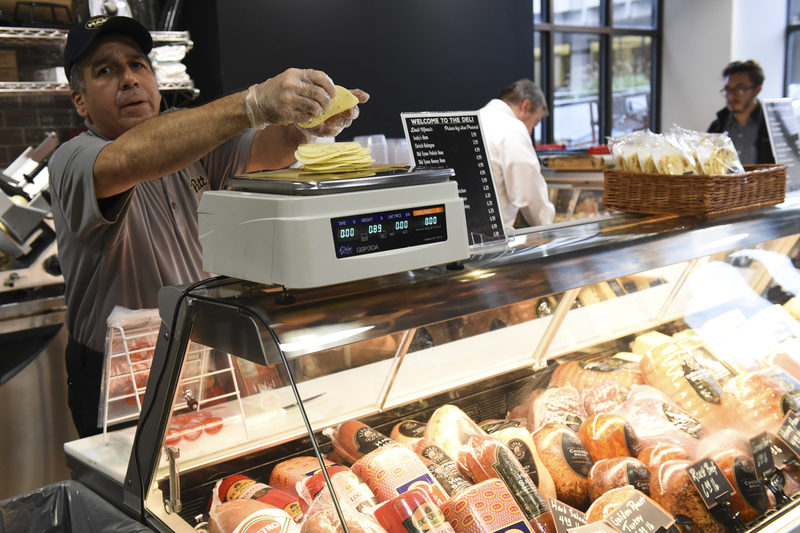 An employee at Forbes St. Market weighs cheese on the deli’s scale. College students often have limited options to buy food on a budget, but the new Forbes Street Market seeks to offer a fairly priced grocery selection with diverse selections. The Forbes Street Market opened its doors Nov. 1 to students and other new customers after months of construction. The on-campus market on Forbes Avenue features a wide selection of grocery staples that can be purchased with cash, card, Panther funds and dining dollars. Because this new market allows students with meal plans to use dining dollars to buy their groceries, the Forbes Street Market is drawing competition from other nearby grocery stores that students frequent. Prices on common grocery items at the new market drew comparisons to those at other local grocery stores such as Trader Joe’s in East Liberty, Aldi and Giant Eagle in Shadyside and CVS on Forbes. Staple items such as eggs, milk and bread are a focal point for such price comparisons. Trader Joe’s and Giant Eagle sell a standard dozen eggs for $1.29, CVS sells a dozen eggs for $2.29 and Aldi sells theirs at $1.19. Forbes Street Market sells two types of eggs in a dozen: jumbo cage-free eggs for $3.99 and Amish non-cage-free eggs for $2.29. A 24-ounce loaf of white bread at Aldi sells for $0.85 and a 20-ounce loaf at Giant Eagle for $0.99 per package. CVS sells 20 ounces of white bread for $2.49 while Trader Joe’s sells 24 ounces at $3.29 per package. Forbes Street Market falls on the higher end, selling 24-ounce white bread packages for $2.79. Prices for a gallon of milk are similar between the Trader Joe’s, Aldi, CVS and Giant Eagle at around $3.40. Forbes Street Market only sells a squat quart of milk for $1.99 and a half gallon of milk for $2.27. Although it carries more organic grocery choices, the Forbes Street Market does not carry many common grocery items for college students that the others store do. The market does not sell large packs of water bottles or packages of instant ramen, but it does offer alternatives to traditional name brands such as selling Organic Honey Toasted O’s instead of more well-known Honey Nut Cheerios. Abdou Cole, the resident district manager of the Pitt Dining Services, said the prices of the market’s items are competitive with the other local grocery stores. But he also said it is important to make sure its prices are not too expensive for students. “We worked very hard to minimize the [financial] impact to students and the community to ensure a full market basket of shopping would provide not only a healthy and delicious option, but also be a value-driven one,” Cole said. Anabelle Scalora, a senior psychology major, said despite being pricey compared to her usual grocery store, Trader Joe’s, the Forbes Street Market is cheaper than Market To-Go. “I wish when I had dining dollars this existed because this is much better to spend your money on,” Scalora said. Despite its benefit for students with dining dollars, Scalora said without a meal plan, the new market is not her first choice for grocery shopping. Cole said the Forbes Street Market garnered noticeable success during its soft launch during Pitt’s Family Weekend Oct. 26-28. The soft launch provided him important feedback from students and parents about the new store. Cole said students found enjoyment in the market’s “Community Chalkboard,” where shoppers can write requests for new food items to be put on its shelves. He also said the market adds new items to every delivery and relies heavily on the Chalkboard for ideas, which include many vegan and vegetarian options such as tofu and jackfruit. Shivani Gaur, a senior neuroscience major, said the new market provides a wide variety of healthy food choices that students with other dietary restrictions can buy. Cole said he has already heard many positive reactions to the Forbes Street Market and hopes that the store will become a frequent spot for students to get their groceries in the future. Cole said Forbes Street Market was made for the Pitt community, and the food items it sells will be updated by what the students who shop there want to buy.